three + two = ? zero - zero = ? There are a couple of substantial reasons that favour the ARGENTAX MULTIPOS - in the true sense of the word. The "heavy brother" of the ARGENTAX REGELBAR is made completely out of zinc. A high degree of versatility goes hand in hand with its robustness. So you can work on all the usual cutting materials with the fitted trapezoid blade. The blade extension can also be adjusted to several levels. As an "emergency reserve" there are five spare blades in the handle. The handle of the ARGENTAX MULTIPOS is made of two metal halves that are held together by a powerful screw. So you get more out of your cutting tool for longer. In spite of the massive design, the ARGENTAX MULTIPOS is not suitable for forceful cuts. Instead, you can use the unpainted variant in areas where metal detectable cutters are required. 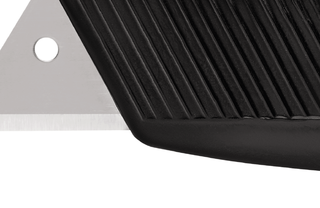 As you can see, the slider is on top of the handle, and can therefore be operated in the same way for the left and the right thumb. The ergonomically shaped handle also fits into any hand. Before changing the quality blade, you can turn it over once. That doubles the usage time of the blade and reduces the energy you spend. Because your product cuts like new again. You will find no less than five spare blades in the handle of the ARGENTAX MULTIPOS. 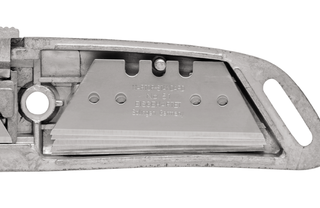 With this stock of trapezoid blades, nothing stands in the way of a consistently high cutting performance.